This page describes my attempt to build an autonomous computational model of fundamental physics, based generally on the cellular automaton framework, but using analog state values instead of the usual binary or discrete ones. The theory has now converged on a complete description of electrodynamics in terms of the coupled Maxwell and Dirac equations, implemented in an analog cellular automaton. In effect, this is the cellular automaton version of the existing Neoclassical Electrodynamics approach, as outlined in more detail in the papers below. Gravitation has also been incorporated into the framework, where it can produce stable Planck-scale black holes. An Analog Cellular Automaton Model of Maxwell-Dirac Electrodynamics. This was submitted to Physical Review A on March 15, 2006. The paper was rejected on the basis that it did not provide any new physical insights, and the units were wrong, and it failed to cite an important paper, likely by the reviewer. Attempts are currently being made to rectify all of these problems. An Analog Cellular Automaton Model of Gravitation: Planck-Scale Black Holes. This is a journal-style paper (a revised version of which may be submitted pending feedback from some experts in the field). An Autonomous, Emergent Framework of Fundamental Physics: Understanding the Universe by Designing It. This is a long paper with a complete explication of the theory and all associated issues, designed to be completely self contained and accessible to readers with minimal physics and math background. This paper is written in a more informal style, and is not intended for journal publication. A Family of Large-Stencil Discrete Laplacian Approximations in Three Dimensions. This is a technical journal paper describing the specific discretization of the laplacian used in the wave equation. It was submitted to the International Journal for Numerical Methods in Engineering, and the reviewer rejected it on the bais that it must have already been done by some obscure Russian's in the 50's, but unfortunately no references were provided. The coupled Maxwell-Dirac electrodynamic system is implemented in an analog (continuous-valued) cellular-automaton operating within a three dimensional regular face-centered cubic lattice. This system consists of a second-order Dirac wave equation for the electron (i.e., the minimally-coupled Klein-Gordon equation with spin, operating on two complex state variables), coupled with electromagnetic potential field versions of Maxwell's equations in the Lorenz gauge. Both Dirac and Maxwell's equations are standard second-order wave equations with some additional terms. An analog cellular automaton produces such wave equations as one of the simplest possible models that exhibits any physically interesting behavior. Furthermore, it avoids standard objections by achieving rotationally symmetric propagation at cellular-scales through the use of a 26 neighbor update equation for the laplacian. To achieve numerical stability, parity must be broken, which may provide an explanation for properties of the weak force. The behavior of an electron trapped by a fixed positive charge is simulated, providing a model of the hydrogen atom system. Overall, this framework may provide an appealing mechanistic model of electrodynamics. A good way to really understand something is to try to build it yourself from scratch. This paper takes this approach to understanding the physical universe. We seek to build an autonomous model that produces known physics in a completely self-contained manner, as a way of understanding how nature works, automatically and without any human or other form of intervention, to produce the known universe. This approach leads naturally to a continuous-valued cellular automaton model, with the standard wave equation as one of the simplest possible forms of interaction that does anything interesting. A small modification of this equation produces the Klein-Gordon (KG) equation, which provides a good description of the propagation of a particle as a wave packet of charge, which is strictly conserved by this equation. Somewhat amazingly, this simple KG equation captures most of the major features of our physical universe, including special relativity, quantum and classical Newtonian mechanics. We further refine our equations to produce coupled dynamics between Maxwell's equations (in potential form) for the electromagnetic force (which obey a basic wave equation), and the second-order Dirac equation for the electron/positron, which is a variant of the KG equation. Gravitation is also included, as a wave-propagating field that alters the coupling constants for the other wave fields, to produce the space and time warping of general relativity. Although still incomplete, we show how this model provides an extremely simple account of much of known physics, including several emergent phenomena that come along ``for free.'' from more basic assumptions. Standard objections to such an approach (e.g., lack of rotational symmetry) are addressed through the use of all 26 neighbor interactions in the second-order wave function. We conclude that there are no major objections to thinking that this model provides an accurate description of reality. Here are some movies from the electrodynamics version of the model, showing a stable electron wave rotating and oscillating around a central postive nucleus charge distribution. Display is as follows: the top-left panel shows the 1a component of the dirac charge wave field, the top-right is the 2a component, bottom-left is the charge density rho (as generated by the dirac waves only), and bottom-right is the scalar electromagnetic potential A_0. For each, one slice through a 200^3 sized universe (with edges wrapping around) is plotted, with values coded by height and color (red = positive, blue = negative, zero = transparent grey). The dirac field variables rotate (1a & b) and oscillate (2a & b) around the central positive charge distribution. The resulting charge rho is centrally distributed. This pattern remains stable indefinitely, although some of the dirac wave value leaks out over time (but average net charge remains stable, while oscillating over shorter time periods). Here are some movies from the gravitational version of the model, showing stable black hole dynamics. 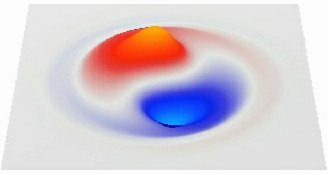 Display shows wave field on left, gravitational field on the right, with typically 29 x 29 x 5 or 9 (horiz, depth, vert) cells shown. The state value is represented both by the height of the plane at each point, and by color & transparency (solid yellow = highly positive, transparent grey = zero, solid light blue = highly negative). Last updated: 12/02/07. Back to my home page.